In this article we will implement a UAVCAN service. The most obvious example of a service in UAVCAN is the node configuration service. We will use the uavcan.protocol.param.GetSet data type to read and write some parameters in Babel. So let's give our Zubax Babel some parameters that can be changed from the UAVCAN GUI Tool. 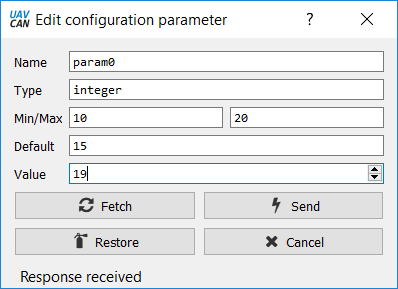 For the sake of simplicity, in this example we will use only integer numeric parameters, although UAVCAN allows you to have parameters of just any type you want. In this example we will have three integer parameters. It is not necessary but it can be considered a good practice to specify the default value and the acceptable value range for numeric parameters. We will also need a couple of ways to access these parameters: by index and by name with some safety checks. Now we need to add a new type of UAVCAN messages that we want to process to the function shouldAcceptTransfer and add a handler call to the function onTransferReceived. We also need to create a function that encodes an integer param to the uavcan.protocol.param.GetSet message. It will be a little nasty, as bit operations always are, but here it is. According to the UAVCAN DSDL specification, section "Dynamic arrays", there should be a bit field (often 8 bits wide) representing the length of the array prepending the array field. But there is one important detail, which plays a role in this particular case. DSDL also defines a tail array optimization, which means that in the case when the array is the last field in the UAVCAN message, there is no need to specify its length and it must be skipped. That is why in the function above we did not specify the length of the parameter name. Now double click on any paramter and try changing its value. 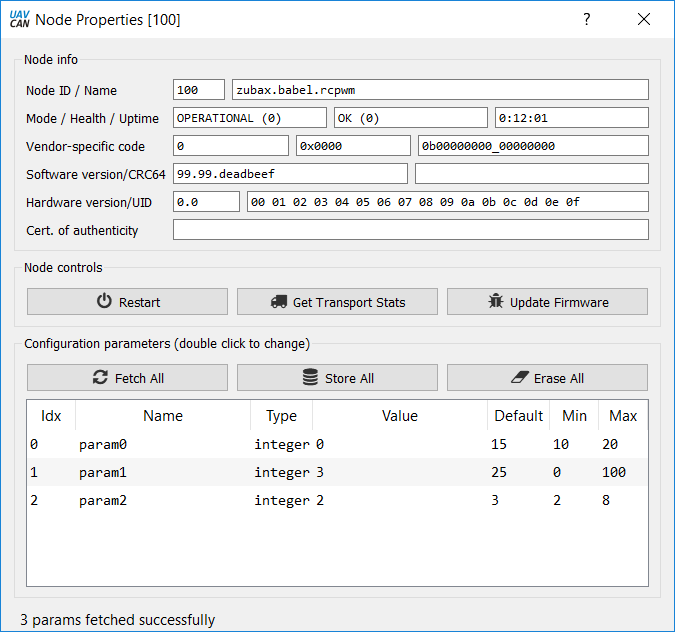 Now close the "Node properties" window and re-open it and refetch all the parameters to make sure you have actually updated the parameter value.